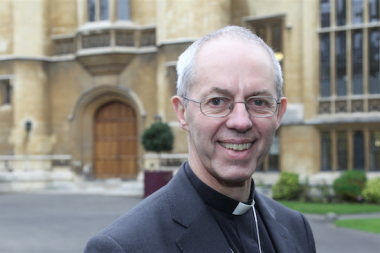 The Archbishop of Canterbury has called for a reshaping of Britain's tax system to raise more money for public services and reduce 'damaging wealth inequality'. A report co-written by Justin Welby with the Institute for Public Policy Research proposes the scrapping of inheritance tax and for it to be replaced by a gifts tax. Total gifts received over £125,000 during a person's lifetime would be subject to income tax, replacing the current loophole that allows people to avoid death duties with gifts becoming tax-free after seven years. The report also calls for a £13-billion a year rise in corporation tax and the creation of a £186-billion 'Citizens Wealth Fund'. It calls for higher taxes on capital gains and dividends, raising another £27 billion a year. The increase in tax revenue would fund a higher minimum wage and grants to help young people buy homes. Pointing out that wages have stagnated for a decade, he says: 'As the Bank of England has shown, for nearly 40 years the share of our national income going into people's pay has been falling while the share going to profits has been on the rise. Stressing that his view is shaped by biblical values, he says the economy needs to be reformed on a scale similar to that after 1945 under Clement Atlee and in the 1980s under Margaret Thatcher. Justice, he says, needs to be 'hard-wired' into the economy. The report from the IPPR's Commission on Economic Justice calls for a boost to manufacturing and exporting sectors, an immediate increase in the minimum wage, and a reform to zero-hours contracts which can leave families relying on foodbanks to survive.